Guru Yoga meditation practice is one of the most important and effective methods for attaining enlightenment. 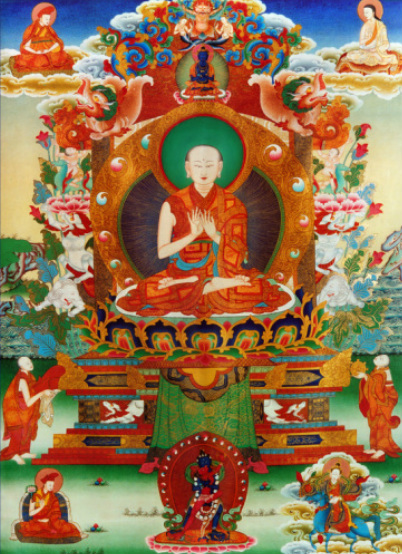 Lama Chopa is the Guru Yoga practice of Lord Jigten Sumgon, the incarnation of Arya Nagarjuna and founder of the Drikung Kagyu lineage. Lord Jigten Sumgon says, "From today on, with one-pointed devotion pray to your great master and practice according to what he teaches. Thus, it is certain you will achieve the ultimate accomplishment (Buddhahood)." The practice is a complete meditation for purifying the four obscurations through receiving the four empowerments of transforming one's body, speech, and mind into the pure enlightened state. We also sometimes offer tsok with the Lama Chopa practice. In a tsok practice, we make food offerings during the practice, imagining that the Buddhas come and accept our offerings. Then we enjoy the food offerings together. You may bring an offering of food or flowers if you wish. Check our Monthly Calendar to see if tsok is being offered with practice.